Until recently I lived and worked in London, but I decided to move back to my home town of Bedford in 2010 with my husband and our five week old baby boy to be near my Mum and Dad. In London I had worked at Shakespeare’s Globe theatre for a few years and then moved to work at global advertising agency DDB London. I loved working alongside creative people and didn’t think when I moved back to Bedford there would be any creative or cultural pot for me to dip my toes in. To be honest I thought it would be the same small town I grew up in, but I was wrong and soon realised that there were people like me who wanted to see art exhibitions, live music, theatre and eat good food! But more importantly there were people who were going to make this happen, like Kayte Judge and Erica Roffe who put their thoughts into action with We Are Bedford. We then had the Castle Quay Weekender, Busking Festival, The Bedford Clanger and recently the incredible pop up Art Exhibition. When I moved here I decided to start a blog www.bedfordnetwork.co.uk so that I could share with people my best experiences of Bedford. It could be a shop, a deli, a cafe, an art exhibition – anything and everything really, but only the best make it onto the blog. I now tweet too @bedfordnetwork and have persuaded my fabulous mum Sue Gough to join in the fun. Bedford may be a small town, but it has big ideas. Thanks to the work of We Are Bedford there is now a real buzz to the town and it has been an inspiration to others, like me and my mum, to start our own projects like BedfordNetwork and keep going with them. Life has now been given to the cultural quarter of Bedford. In fact we now have a cultural quarter! It takes an improbable amount of people to make an event like this happen. Amy Jane Cahalane without whom this festival would not exist. We need more people like you in local councils! Anna Louise Walsh and the Creative Bedfordshire network, we salute you too. Nigel Faircloth and Amar Dosanjh for having the foresight to see the value in an event like this, we hope it does the trick. Thanks to the many at Bedford Borough Council who have helped. Andy Pigeon for early practical support and later moral support. David Freer at CDP for your open-minded enthusiasm. Thank you for your trust. The Mayor, Dave Hodgson for your support. Alom at The Riverside Grill, you have been an enabler in both a practical and personal sense. Cat Moore, thank you for bringing calmness and efficiency to the proceedings. We needed you on the team. Thanks. Jane Edden for being a fabulous artist and a practical problem solver extraordinaire. We appreciate your generous spirit. Even if you did abandon us for turtles. Charlotte Tenneson for your hard-graft-attention-to-detail-straight-talking-cake-making ways. Kristian Purcell for your curator’s eye, fabulous hair and dedication (despite having no computer)! Olindo Piombino, we could thank you for your hard work and dedication but really we want to thank you for your ‘pea-head’. Genius. Linda Boy, a champion of local crafters. We salute your principles and the time you spent helping us and managing the craftspace. We will do everything we can to support Bedford Handmade Market. Christine Gallagher, Phil Gallagher and Jacqueline Haddock and all the artists you represent at the Eagle Gallery and Infinite 29. Your management of the POP t’ART gallery has been invaluable, and the responsibility you have taken has been significant and wholly appreciated. Kendall and Steve at Lady K’s thank you for your practical support and enthusiasm – you have been vital to the event. Thanks to your beautiful burlesque models too for adding a touch of naughtiness to the whole event. Stuart Runham, what would we have done without you? Your MOD training put you in good stead for our H&S requirements and your photography and film support has been invaluable. Laura Baker, a woman of considerable professional standing but happy to spend weekends stuffing envelopes, and painting breeze blocks and writing web articles for the cause! You are a life-saver. Rebecca & Rob Taylor – I told you labels were hard! Thank you. Rob and Pete we are so happy that esquires are bringing the talent, and so glad you are building the stage! Thanks to all who are playing. John from the Blue Glass, the wine tasting is a generous contribution and one we will be partaking off! Thank you. Gemma Hutton, Victoria Partridge & Tom Perrett, the support the museum and gallery has given this event is second to none. From lending us chairs, to tweeting furiously in our support, to hosting two of the key events, we couldn’t have done this without you. Braps to the Cecil Higgins Museum and Bedford Gallery. Anne Godwin your miles and miles of bunting will transform the craft space into something altogether more beautiful. Annie and Danny Stijelja between you you have given us so much help. The stencils worked a treat, and hand delivered! Danny thank you for your ideas and patience in the early days of our identity. And let’s not forget the donuts. Jason, Mic, Andrew and Steve at Bonfire – you made us beautiful! We gave you grey hair! The design work has really taken this event to another level. Thank you. Kevin at K4 thanks for doing us a deal on the print of the flyers and posters. Graffit, Fons, we are looking forward to seeing those vinyls – they’ll add class and coherence to our otherwise handmade project. Mark Astle at Spark Creative. You are not even from Bedford and you stepped in when you saw we were struggling with our website. We have a beer or two lined up for you. Max from reestore and Lisa from uoldbag!, not only have you added a touch of glamour and celebrity to the whole show you have worked bloomin’ hard to make your Junk Quay design shop great. The workshops will be fab. Mario from Someone Once Told Me thank you for taking time to visit Bedfordshire for the second time. People are so excited to meet you. John Hegley – the star of the show – you don’t know it yet but you are funding our balloons. Thanks for coming to our event! Maria from Pensieri, not only have you given us cake, you have been an unwavering and friendly supporter and we really appreciate it. And our feral kids love you too. Andrew Keen from The Swan who has supported us and added to our event by offering special offers and an extra exhibition. You also do the best salmon salad we have ever eaten but that’s besides the point. Diana Moss for your hard work in bringing images of Bedford from the Bedford Camera Club to The Swan. Angelo, your café wasn’t even open yet and we were banging on your door asking for help, thanks for hosting our pre event party. Best of luck with your business, we think you’ve picked a great spot. Jo from the School of Craft – your pop up post office is adding fun for the kids and is an ingenius way to include people who can’t make the event. Chip! Tea from your camper van was just what we needed, and your skills with a spray can (and subsequent brain damage from the fumes) are appreciated! Marisa and Jack, thank you for painting breeze blocks and making millions of posters and being generally very helpful smiley lovely people to have around. Bedford Modern, thank you for lending us both your junior choir (thanks Hazel) and providing us with lazer cut wooden signs and plastic stencils. Bedford Bid, thank for the sponsorship – the programmes wouldn’t have been printed without you, and Caryl you have gone above and beyond the call of duty in all the support you have given us. Rajapack – thanks for the boxes! Our signage looks fantastic and we can use it again so sustainable too. SDC you were so generous with your paints and rollers, you helped turn empty places into artistic spaces. Nicola and Cherry at John Bunyan Museum, you were generous with your time and space and have added a lot of value to the event. Ian McEwen, Mike Shelvon and Mark Steinhart, our wordsmiths, thank you for putting yourselves forward and for taking the plunge together. Jane Perrone, Kathy Brown and the Transition Bedford team, thank you for adding some greenery to the weekend. Tom Barwood, as ever up for anything, thanks for being John Dimbleby to our Question times. Thanks to the Hemlock Morris Dancers, and Andrew in particular for agreeing to dance for us. Thank you to all our buskers, young and old and to Heather at Cambridge County Council for helping us find them! Our local Papers the Times & Citizen and The Beds on Sunday, you got behind us! It means a lot. Thanks to Crown Paints for their offer of paint. Thanks to Trevor and the team at The Bedford Association of Tour guides and Anna at Albion Archaeology for adding some local history to the weekend. Bedford Creative Arts and the Konvertible Project, thanks for letting us speak at your workshop and for attending. Thanks to all the vendors, crafters and makers and to the artists exhibiting their work. May you sell everything! To all the musicians, choirs, buskers, bands, thank you all. Thanks to Bedford College, in particular Sue Blackman, for your support. Bedford College Fine Art Students Ros, Kaya, Kaylee, Heather, Klaus, you have taken on a great responsibility and we hope you enjoy every minute. Thanks to the RSA – where this all started! Special thanks to Judith Woodhead for your support, and to Alex and the panel for agreeing to fund us and for your support throughout. Bedford Corn exchange for your support and selling our tickets. Emily – you pioneer you – you paved the way, thanks for helping us and may Bedford Burlesque go from strength to strength! Meanwhile space, and A Thin Place, Hightown art for all good to speak with you and see the good work you are doing. Carol Atkinson of Books by Carol thank you so much for quietly helping without fuss nor bother – your contribution is really appreciated. Richard Hull, your data skills were invaluable. Castle Lower School thanks you for the lend of the tables! Chris Barratt from Brandon Hire, you are a total star. Kristina Bullen for letting us use your images in the early days. Tony Chris Somervell, for your poster distribution, guest blogging and enthusiasm. Shaz Buns! thanks for being part of it and helping paint the units. Poster distributors everywhere – thank you! Little Monkey Murals – thanks for the balloons. Deborah Shrimpton at Pride in Bedford – thanks for the t shirts! Shaun Keaveny from 6music for flirting with Erica live on air. To all the volunteers on the day – thank you. Our biggest fear, after bad weather and any kind of damage to anything precious including property, artwork or small children is forgetting to say thank you to someone who has helped us. So if you have got this far and not seen your name then please please please tell us. We appreciate everyone, and we mean e.v.e.r.y.o.n.e who has helped us. It has meant the world. This is a guest blog from artist Charlotte Tenneson, she may look small and ladylike but she is a powerhouse. We’d be lost without her. “I joined WeAreBedford so early on that I was lucky enough to be at the first official meeting in the Pensieri Café and Gift Shop. I knew a couple of people at this meeting, but mostly they were complete strangers to me …. but not now!! On Saturday 5 March we painted the walls of the galleries, with paint, brushes and rollers donated to us by SDC Construction Group – MANY THANKS!! Kayte Judge arranged for a scruffy bunch of volunteers to arrive at 10.00 am to help us paint the walls; we actually asked them to wear old clothes; I am sure they wash and brush up well normally. The paint was lovely and thick, just like the very best double cream, and went on beautifully. Not just on the walls, but in our hair, our clothes and a few people even had it in their eyes (Kristian’s beard turned white too!) I am so very grateful to all the volunteer painters, they did a brilliant job and they were good company too!! It took about two hours to paint each gallery space and we were completely done and dusted by 3 pm. I am a mother of two teenage daughters and I was definitely aware of my painting muscles the next day, despite a hot bath, wine and a few chocolates that night. We have two handing in days for the artwork, this Saturday and the following Tuesday and then we will be ready to hang the work and open up shop for the Castle Quay Weekender. I mentioned the artwork is wide-ranging and we would like to think that we have work that reflects the different people creating artwork in our local community of Bedford. You can expect to see the Queen’s Head created in used stamps; a beautiful painting of blossom; a large multiple canvas piece created in situ with ink; talented photographic work; a sculptural self portrait in peas; delicate illustrations and collage work; paper sculptures; a traditional, Rubens inspired painting of a Drunken Silenus, a still-life painting of vintage crockery (that one is mine) and a lovely picture of a hedgehog by Max (aged 8), among many others and most of it is for sale. All that has to be worth coming for! Well, I have been inspired by the creative people I have met so far; all we needed was a little push and things have really snowballed (thanks Kayte and Erica). I have so enjoyed being part of this event, meeting new people and the best part is yet to come on the 19 and 20 March. I know I will feel a void when it is over … but will it be a one-off or shall we organise another? Things are really starting to happen at the not-so-empty-shops now. The last few days have been a great example of people working together for the common good rather than the mighty dollar. 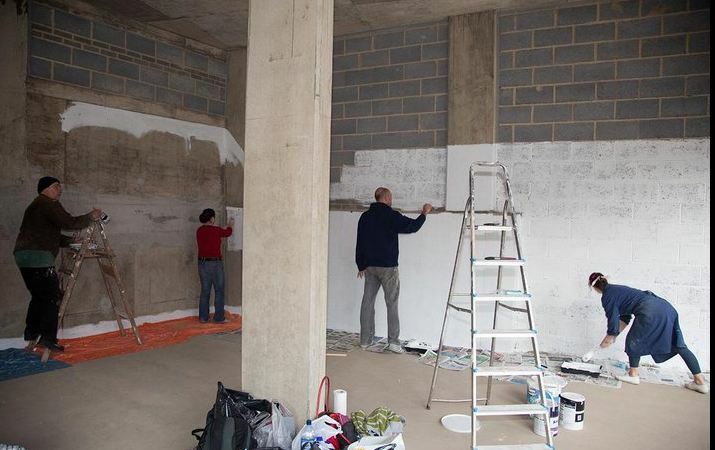 On Saturday morning a group of our volunteers met at Castle Quay to help us paint the gallery units. Some of the people had met each other before, most had not. Within a few hours, white emulsion had replaced grey breeze blocks. Chip had the foresight to come along in his camper van, so was able to provide a warming brew to the assembled helpers. Charlotte’s two cakes certainly helped too! While we were preparing the units, Kayte and Chip cracked on with spray painting the gazillion boxes kindly donated by Rajapack. The stencils (the handiwork of Bonfire CI and Bedford Modern School art dept) look amazing! This morning, further excitement as Jane Edden and her crack crew of Bedford College art students arrived to install the sculpture. Almost simultaneously, the DSD guys turned up to deliver some of the council’s beautiful deckchairs which will provide seating for the acoustic stage and Linda Boy from Handmade Markets joined us to do a final measure-up of our craft space. As if on cue, the Times & Citizen photographer was on hand to capture the frenetic activity, so let’s hope we’re back in the paper tomorrow! All in all, while it’s been a hard slog getting to this stage, it lifts the spirits and makes your heart sing to see how much un-paid effort people have been prepared to give to this project. Whether it’s painting a wall, designing our programme, coming along to busk, making a cake or even just telling your friends about what we’re doing, We Are Bedford is really living up to its name. And we’re very proud.